The Rolling Stones have unveiled the poster for their forthcoming film, “Crossfire Hurricane,” which will be shown live in cinemas across Europe on October 18. 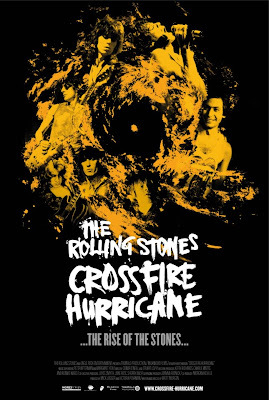 “Crossfire Hurricane” provides a remarkable new perspective on the Stones’ unparalleled journey from blues-obsessed teenagers in the early 60’s to rock royalty. It’s all here in panoramic candour, from the Marquee Club to Hyde Park, from Altamont to Exile, from club gigs to stadium extravaganzas. With never-before-seen footage and fresh insights from the band themselves, the film will delight, shock and amaze longtime devotees, as well as another generation of fans, with its uniquely immersive style and tone. “Crossfire Hurricane” places the viewer right on the frontline of the band’s most legendary escapades. The film combines extensive historical footage, much of it widely unseen, with contemporary commentaries by Mick Jagger, Keith Richards, Charlie Watts, Ronnie Wood and former Stones Bill Wyman and Mick Taylor. Period interviews, extensive live performance material and news archive give the production a truly kinetic aura and unfettered approach. Over 250 cinemas across the UK and Ireland will screen “Crossfire Hurricane” live from the 2012 London Film Festival in London’s Leicester Square, and fans will be able to watch live as Mick, Keith, Charlie and Ronnie chat on the red carpet, with director Brett Morgen interviewed about his remarkable, no-holds-barred insight into key periods of the extraordinary career and incredible adventures of The Rolling Stones. Tickets for all cinemas are on sale now – for details, visit www.Crossfire-Hurricane.com or the individual cinema website. Following its theatre debut, “Crossfire Hurricane” will see its US debut via HBO on November 15; it will also be broadcast on BBC Two later in the year.